Moose 04, originally uploaded by Edith OSB. I expected to see beautiful scenery as I drove across North Dakota on US-2, but I certainly did not expect to encounter the more rare types of wildlife. 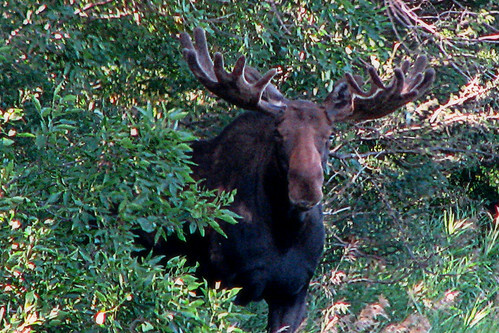 But on the far west side of the state, there they were: a family of moose browsing in a field and in some trees, just a few hundred feet from the side of the highway. It’s legal to stop on the shoulder on US-highways, unlike the interstate. I had to loop back at the next crossing point, but they were still there when I came back. This fellow sure saw me, but didn’t seem much interested in doing anything about it. 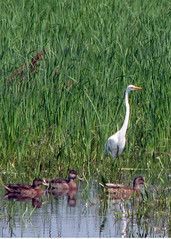 Earlier in the trip, I had also seen a pair of Great Egrets in wetlands between Michigan and Doyon, North Dakota. I hope to post some of the photos from Montana, including the view from the top of Pompey’s Pillar.